New bass from unused space! Earthquakes new SleekWave CP8 subwoofer can what others can not. It can be placed under / behind a sofa or bed. With a SleekWave subwoofer, you can now get a powerful and deep bass without taking up space on the floor. 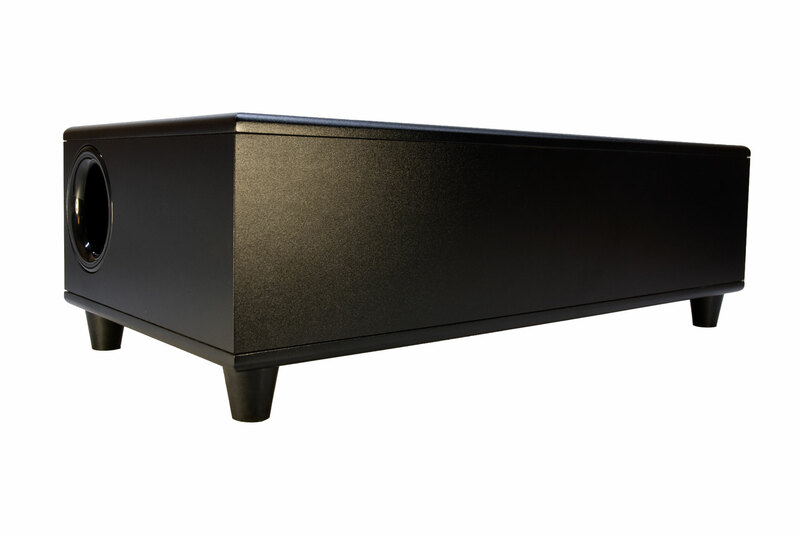 SleekWave CP8 is based on the same over sized quality components known from the successful SUB80 subwoofer. A powerful 150 watt amplifier and an 8-inch long-throw woofer with 2 inch voice coil ensures high output and long life. A large bass port on the front of the subwoofer ensures high output of the lowest frequencies and gives the strong woofer optimal working conditions, resulting in strong and accurate bass. The bass port allows you to get bass out from under a couch or bed without loss of precision and energy. With a height of only 17.8 cm it can be stored under most sofas and beds. It can also be placed on the side if there is space between the back of the couch and the wall. If you have a mere 17.8 cm of space there is room for strong bass. CP8 - Powerful, rational and placement friendly.